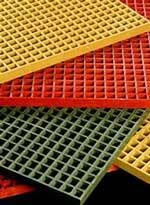 A Fiber-Reinforced Polymer (FRP) is a compound of a polymer resin matrix with embedded glass strands. It comprises high-strength, lightweight versatility with high corrosion resistance properties, characteristics which make it an attractive alternative to structural steel in a range of industries – including the beverage market. Fiberglass is intrinsically linked to industrial bottling processes, and the eventual disposal of recycled glass bottles. A variety of fiberglass installations are available to improve the efficiency and accessibility of bottling lines in beverage and condiment factories. These industrial environments often require sturdy grating which can withstand heavy, daily traffic while offering safe and easy access to conveyor lines. Brewing tanks or pressure vessels too may require accessibility via ladders, stairs, or walkovers formulated using steel or fiberglass grating. Strongwell’s DURAGRATE® and DURADEK® pultruded fiberglass grating features a chemically-bonded web of fiberglass bars, providing excellent structural stability and long-term fatigue resistance, even when manufactured into unusual platform configurations and shapes. It also has a high-resistance to standing water and various corrosive chemicals, including different classifications of alcohols – excluding 100% Ethyl, and 100% Methyl. Fiberglass grating also meets stringent industry health and safety standards for fire retardancy and slip-resistance, with high-impact fiberglass handrails providing a safe working environment at elevated heights. Our pultruded fiberglass ladders offer similar benefits to fiberglass grating, with long-term durability and resistance that cannot be matched by comparative steel products. With low thermal conductivity, they can be safely applied near temperature-controlled brewing tanks or pressure vessels. Glass bottles comprise a large volume of municipally recycled glass which is purified and repurposed into new glass containers, reducing industrial waste on a global scale. While modern glass recovery and recycling processes are attributed to a reduction of thousands of pounds of greenhouse gasses every year, problems remain with the collection and processing of glass – which can be difficult to repurpose if it breaks in transit, or at any point during the recycling process. The resolution to this issue for many manufacturers is to crush the product, creating cullet. These glass fibers can be used in the formulation of a range of fiberglass products. Cullet from glass bottles is commonly utilized in the manufacture of fiberglass insulation, however, the manufacture of thoroughly and consistently industry-worthy fiberglass products requires the implementation of only the highest quality cullet. This municipal project can result in material impurities, which in turn can be detrimental to the structural integrity of resultant products which must conform to strict regulations and standards. Hence, fiberglass products from Strongwell strictly use virgin fiberglass with zero recycled content. Strongwell has been manufacturing pultruded products since 1956, and were among the first companies to establish innovations in pultruded fiberglass grating in the 1970s. Our fiberglass product range is now the world’s largest, with commercial and industrial applications in an enormous range of sectors. Our low-maintenance fiberglass grating is available in a range of grades and specifications, under two primary product lines: DURADEK®; and DURAGRID®. Each offers distinct benefits over traditional steel, and other fiberglass products, with bars of varying thicknesses and shapes, and customizable barring spaces. With high skid resistance and anti-rust properties, each is uniquely suited for application in food and beverage factories. If you have any questions about our fiberglass products, please do not hesitate to contact us.